To make this recipe vegetarian, substitute vegetable broth for the chicken broth. For more tips and info on this recipe, visit the Kenmore Genius Blog, where I originally published my chipotle black bean soup recipe. Yield: Yields 2 large servings (about 2 cups each) or 4 small servings (about 1 cup each). Chipotle chiles give a kick to this hearty black bean soup. 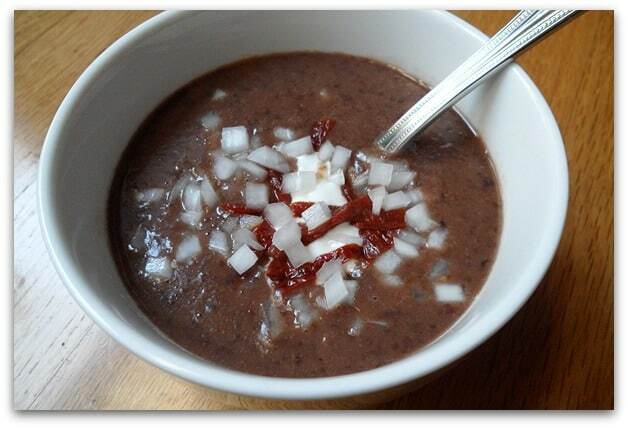 Add black beans, chicken broth or vegetable broth, adobo sauce and chipotle to a blender. Blend until smooth. Add the garlic, onion, cumin and Mexican oregano. Blend again for about 30 seconds. Pour the contents of the blender into a saucepan and bring to a boil over medium-high heat for a few minutes. Reduce to a simmer for 5-7 minutes or until the color of the soup darkens and thickens a bit. It should reduce slightly. Be sure to stir frequently so the beans don't stick to the bottom of the pot. Ladle into soup bowls. Garnish with a spoonful of crema Mexicana, chopped onion and if you like, some sliced chipotle pepper. You can also see all the other recipes and tips from The Other Side of The Tortilla on the Genius Blog. How do you like to make your black bean soup? Uff, totally my type of mexican comfort food. Yo quiero!! !